It is extremely important to identify and spot a stroke so that immediate medical attention may be sought. Stroke is a major cause of permanent disability in the U.S. and the fifth leading cause of death. 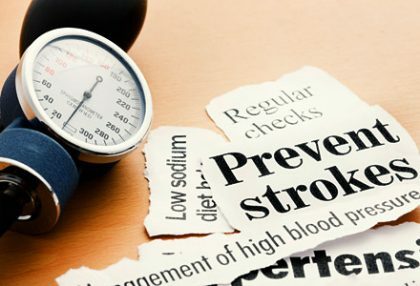 According to an estimate by U.S. Centers for Disease Control and Prevention (CDC), every 40 seconds someone in the U.S. has a stroke, and every four minutes, someone dies from a stroke. Time is brain and therefore earlier a stroke is recognized and treated, the greater are the chance of recovery. 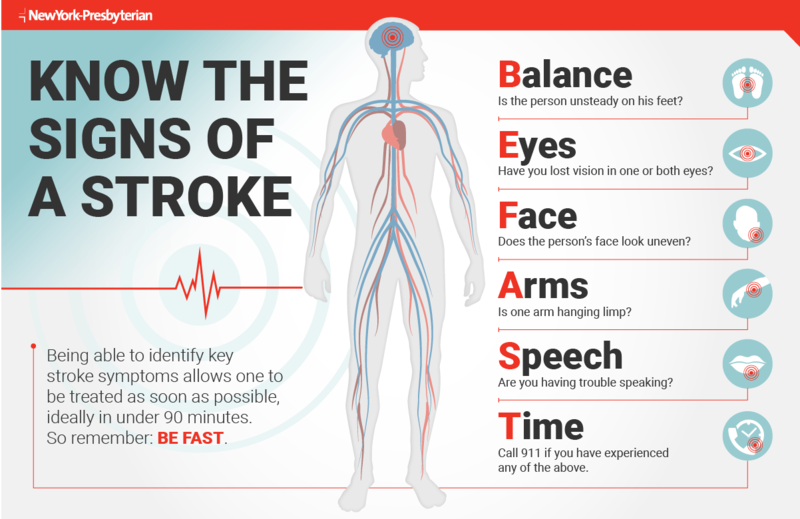 Remembering the acronym “BE FAST” is a simple way to learn how to recognize the signs of a stroke and act quickly to minimize its long-term damaging effects. Reduce salt intake. High blood pressure is one of the leading causes of stroke. Cutting back on salt is one of the most significant steps to maintaining or lowering blood pressure to a healthy level of 130/80 or below. Americans get most of their sodium from processed and restaurant foods so compare and check labels on packaged foods. When flavoring your own food, try substituting salt with other spices. Eat a heart-healthy diet. Maintaining a healthy balance between your good cholesterol (HDL) and bad cholesterol (LDL) is the best way to prevent high cholesterol, heart disease and reduce your risk of stroke. Cholesterol levels should remain at 200 mg/dl or below. Eat a balanced diet with plenty of high-fiber foods, such as fruits, vegetables, whole grains, legumes, and nuts, while reducing high-calorie, processed foods, and beverages that don’t contain a lot of nutrients. Stop smoking. Smoking is harmful not only to your lungs but your brain as well. Because smoking damages blood vessels, raises blood pressure and speeds up the clogging of arteries, people who smoke are at twice the risk of having a stroke. Exercise. Exercise benefits everyone, so we should all aim for at least 30 minutes of moderate exercise multiple times a week to improve our overall health. If you are obese or overweight, your risk for high cholesterol, high blood pressure and diabetes increases and so does your risk for stroke. Limit alcohol: Heavy alcohol use – more than one to two drinks a day – increases your blood pressure and your risk of ischemic attack and hemorrhagic stroke. It’s important to note that certain populations are at a higher risk of having a stroke, even after making the proper lifestyle changes. These include adults 55 years of age or older, African Americans and Hispanics, those with a family history of stroke and people who have already had a stroke or a transient ischemic attack (mini-stroke). In addition, women are more likely to die from a stroke than men, although attacks are more common in men.